Wheather in the fantasy-film "The Neverending Story", in "Cocoon", or in his latest role "DARYL", the 13-year-old barret oliver is convincing in each film-role. "Pop/Rocky" visited the successful young actor in his parents' home in the USA and took a look into the exciting life of a "Performer Family." It is Saturday afternoon, and Barret Oliver, who has grown a fair bit since the days of "The Neverending Story", and has become visibly more confident, opens the front door for us. "Hey, you've come while I'm in the middle of painting my room, but that doesn't matter". 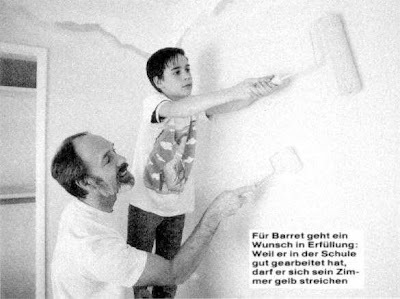 Of the three principal actors of "The Neverending Story", Barret is the only one who has been working continuously since then. That is also the reason that this interview takes place on a Saturday afternoon. During the week, Barret is already making his next film "The Legend of Sleepy Hollow", an American fairy-tale. Mother Kathy accompanies Barret to the film-set! Barret is much in demand and successful. "We have all worked hard at it", his mother Kathy tells us. "It involves everyone in the family. Whenever Barret makes a movie, his father Kent and his brother Kyle must cope alone, while Barret and I hang around in hotel rooms." It was like that too with the film D.A.R.Y.L., which is showing at the moment in German cinemas. Barret filmed for three months in Florida, South Carolina and London. While he was involved in the movie-making, he also had three hours of school-work each day on his schedule. "An [exciting?] 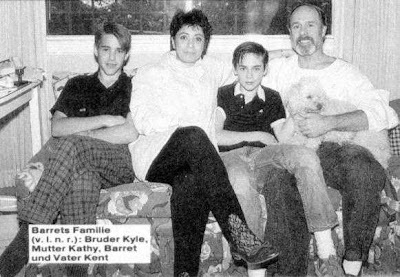 time ", mother Kathy says, "Barret needed a long break after it so as to become a normal boy again. However, this was not at all easy to do, as "Cocoon" soon arrived in the cinemas -- the telephone rang constantly, and many new film-offers arrived at the house. How did it all actually get started? "A friend of the family worked as [photo-agent?] and thought that our older son Kyle, who was then 6 years old, would be suitable as a model and should [put himself forward]. 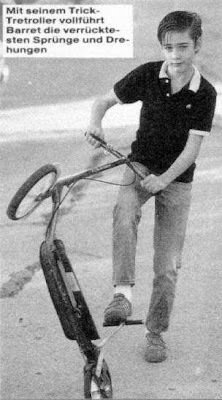 As a result Kyle made promotional films, and it was tremendous fun for him. When Barret became 6 years old, he wanted to be like his big brother and begged: "Daddy, can I be an actor too? ", says his father Kent, who works as an interior-designer. In a very short time, Barret was much more successful than his older brother. For the 15-year-old Kyle, the present-day situation is not at all easy. He is a bit envious and would also like to make feature films and be in the middle of things. "I'm not so interested in acting," Kyle claims, "I would prefer to become a director." Barret confesses he has no especially close relationship with his brother. "Sometimes we understand each other very well, but generally we don't. I am happy by myself and play with my robot-figures." Barret eagerly fetches models and books from his room to show us. "In school" adds Barret "Mathematics and Science are my favorites. On the other hand, I hate English", he grins. "But luckily there is no school today, otherwise I could never get my room decorated."